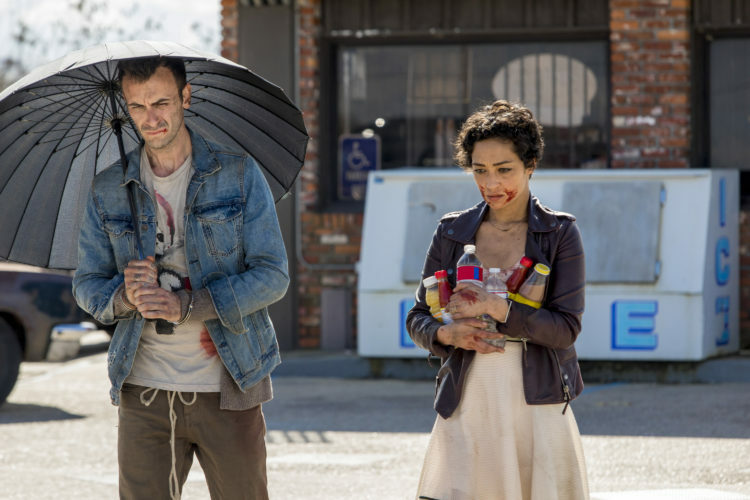 For fans of the Preacher comic who were bewildered and disappointed with the TV show’s introductory season, the Season 2 premiere has to feel more like home. The episode picks up right where Season 1 left off. While the nation is glued to their TVs watching coverage of the small Texas town that just exploded, our intrepid heroes – Jesse, Tulip and Cassidy – are speeding down the backroads on their first day in their search for God listening to the radio and Cassidy’s conspiracy theories about where all those discarded foreskins end up. 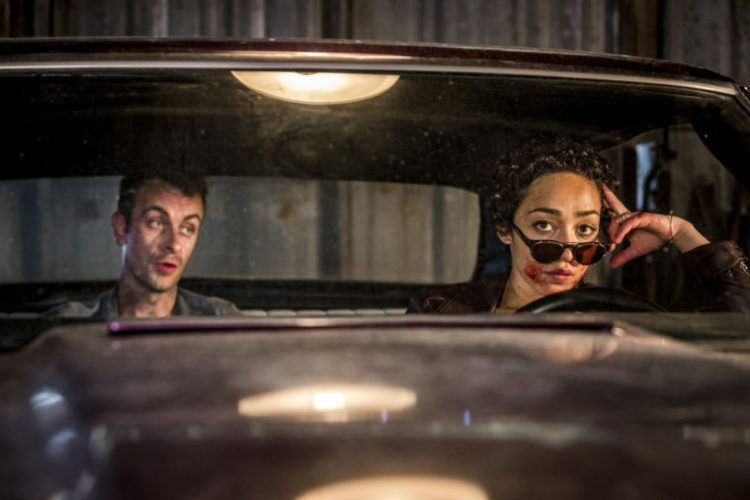 In fact, the entire cold open serves as a crash course in the world of Preacher as it touches on the trio’s general Bonnie and Clyde (and Vampire) lawlessness, Jesse’s Genesis powers and what is sure to be something we’ll see often – the Saint of Killers seen only as a speck on the vanishing point on a road stretching to infinity. The Saint might be far away, but it makes him no less deadly. His trusty six-shooter with Hell-powered ammo blows large holes in cars and people alike. The gore was used as a dramatic left turn from the fun that Jesse was having making the Texas State Troopers hold hands, sing and pepper spray their nuts. 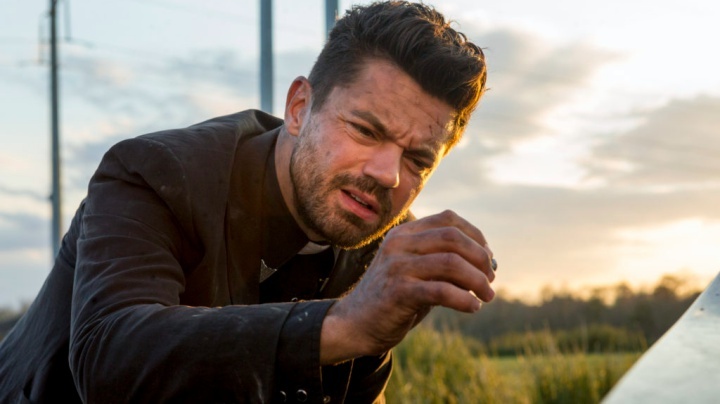 The crew gets Tulip’s car running again and escapes the scene one step ahead of the Saint, and the heart of the search begins with a pit stop for fuel and an overnight stay with Preacher Mike, a biblical scholar. While Jesse finds Mike, the groundwork for one of the underlying stories of the season is laid. After their one night of passion together, Cassidy is still very smitten with Tulip. He wants to clear the air about it with Jesse. Tulip shuts down that train of thought right away, but the cloud still hangs over the three of them. Preacher Mike has some unusual methods, because when one of his flock feels the satanic urge to drink, do drugs or post to Instagram, he locks them in a covered cage in his shed. That fact causes some initial distrust from Cassidy and Tulip, but despite the rough edges, Mike is a good guy and a man of God who is genuinely concerned that a supreme being has gone missing. Mike has a lead in a parishioner named Tammy, who operates a run-down burlesque club/shake joint in the next county. Mike thought Tammy was white as a ghost and shaken because became reacquainted with Jack Daniels, rather than having seen God, as she claimed. He reconsiders that line of thinking, given God’s MIA status. After an awkward night of Jesse, Cassidy and Tulip sharing a bed together, they head off to find Tammy. There’s now a sense of urgency built into to the show, because whenever, wherever the trio stop, the Saint isn’t far behind in his relentless pursuit of his bounty. It cost a gas station owner his tongue, and Preacher Mike his life (but not before he got in some choice insults). The club is as run-down as you’d expect with a jazz trio providing the background for the gyrations happening on stage, and it isn’t long before we’re treated to one of the cleverest scenes in the series to date. Tammy isn’t really forthcoming with a lot of details about her God sighting. As Jesse and Tulip menacingly discuss the etiquette of when to use Genesis on a person, you see Cassidy’s story unfold on a silent security monitor above their heads. Cassidy took his investigation to the champagne room with one of the dancers and immediately got too handsy causing the bouncer to be called in. The tension rises as Jesse and Tulip’s banter becomes more aggressive. Tammy is frantically calling for the bouncer to come protect her, but he’s too busy trying to wrestle his gun away from Cassidy. The two scenes converge when a muffled shot rings out on the monitor but the bullet flies through the office wall and into Tammy’s chest. Jesse is frantic at this point, as he and Tulip determined that God had to be coming to the club night after night because of a particular dancer. With her moments on earth running out, Jesse uses Genesis to reveal who it was who caught God’s eye. Tammy says it wasn’t a girl, it was the jazz. God appreciates a good jazz trio no matter where it plays. Finally alone, Jesse and Tulip share an evening of bathroom door-breaking, headboard slamming passion, as Cassidy tries to ignore what he knows is going on in the next room. Jesse later goes out for a late night smoke, when he sees a speck on the vanishing point of an infinite stretch of road. 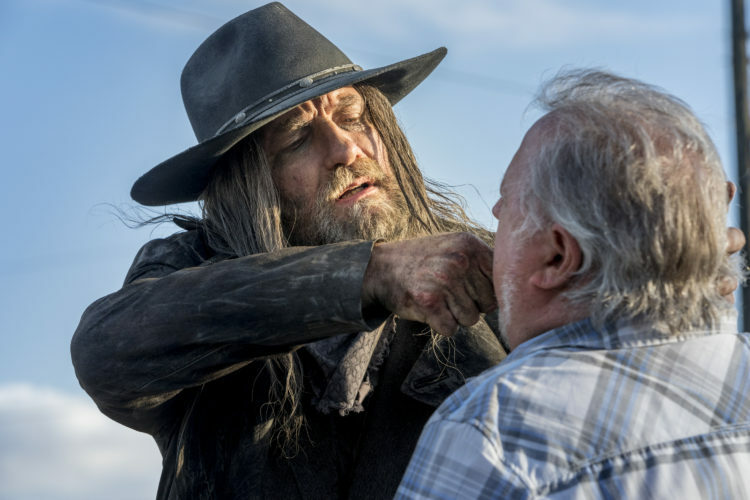 He tries to use Genesis to get the figure to stop but the duster clad being will not heed, and we’re left with the sight of the Saint of Killers raising his pistol in Jesse’s direction. (Thank goodness the cliffhanger only lasts 24 hours). 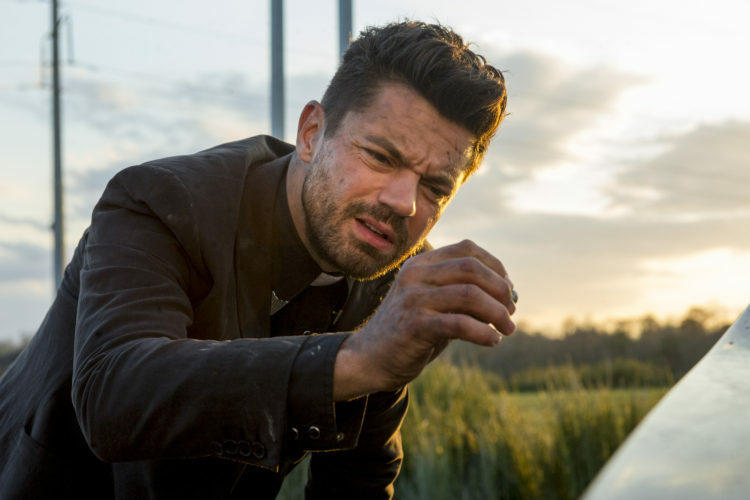 The road trip nature and the Saint’s relentless pursuit has done wonders for a series that suffered pacing issues in its first season. With the main characters on the run, the biggest challenge now is to give them the time to change and grow. All the clever camera tricks and quirky characters of the week become tiresome if the core group never learns anything. There’s a lot of Season 2 to go, and so far, it’s a fun ride.